Anna Bokov is an architect, urban designer, educator, and historian. She holds a Ph.D. from Yale University, a Master's degree in Architecture from the Harvard Graduate School of Design, and a Bachelor's degree in Architecture from Syracuse University. She has taught at the Cooper Union, Yale School of Art, Northeastern University School of Architecture, the Moscow Architectural Institute, and Strelka Institute. Anna has worked as an architect and urban designer with Office for Metropolitan Architecture in Rotterdam; NBBJ in Moscow; Gluckman Mayner Architects and Polshek Partnership (Ennead) in New York; and the City of Somerville Office of Strategic Planning and Community Development in Somerville, Massachusetts. She has served as an editor for the Project Russia magazine, a leading architectural periodical in Russia. Her work has been presented at the Walker Art Center, Venice Biennale, Moscow Architectural Biennale, and AIA New York. Anna's special areas of expertise include the history of the avant-garde movement and design pedagogy. 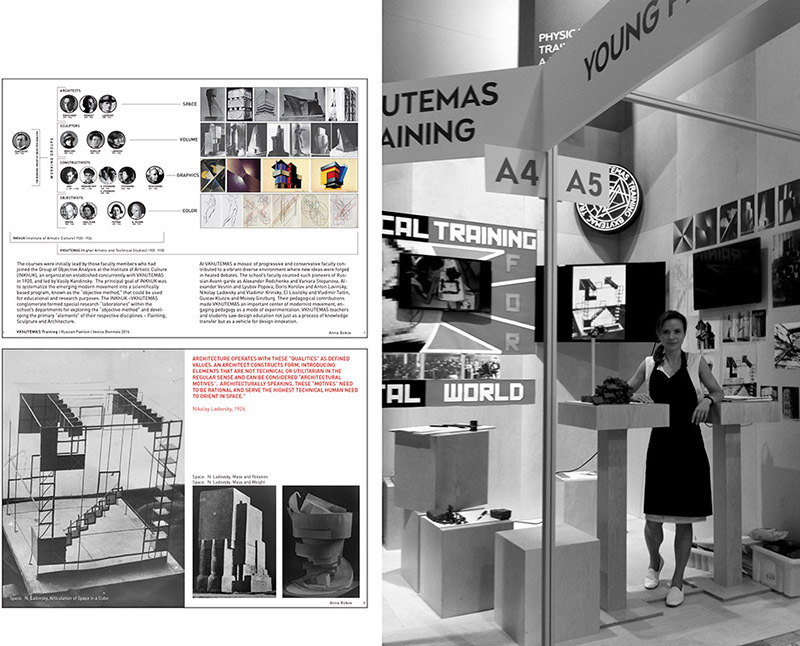 Her Ph.D. dissertation at Yale, titled Teaching Architecture to the Masses: Vkhutemas and the Pedagogy of Space, 1920-1930, examines the emergence of modern design education through the lens of Vkhutemas, an inter-disciplinary higher education institution in the 1920s that has been termed the "Soviet Bauhaus." Her work focuses on the various pedagogies developed at the school by the leaders of the Russian avant-garde, including Nikolay Ladovsky, Alexander Rodchenko, Moisey Ginzburg, and others. Anna was a recipient of the Mellon Fellowship and of the Beinecke Research Fellowship at Yale, in addition to being awarded an honorable citation from the Graham Foundation. She is currently working on the publication of a book on Vkhutemas and its avant-garde pedagogies. View Anna Bokov's full CV here. This research is the subject of a doctoral dissertation that examines the history of design pedagogy through the lens of the Higher Art and Technical Studios, known as VKhUTEMAS, active in Moscow in the 1920s. 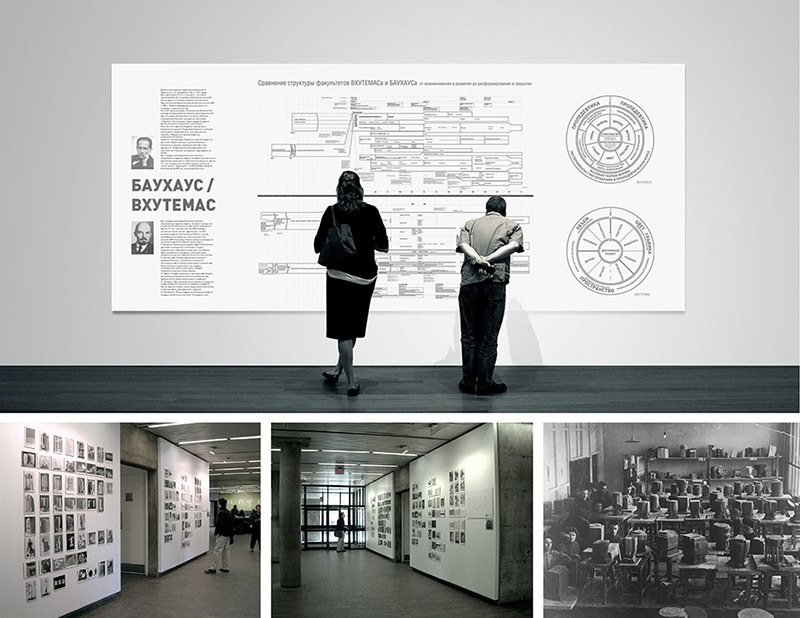 VKhUTEMAS was a platform for institutionalization of the avant-garde movement - an educational experiment of unprecedented scale and complexity that distilled radical experiments in art, architecture and design into a systematized pedagogy. The dissertation explores the mass character of early twentieth century design education in Soviet Russia as a formative condition for the modern paradigm. It traces the emergence of a kind of pedagogy, which instead of copying a form asks to articulate and, ultimately, invent a new form. VKhUTEMAS created a standardized, universally applicable approach, in order to train large numbers of students, and to render unnecessary the figure of all-knowing master, instead developing an ostensibly objective, scientifically based method. The central figures in this undertaking - the architect and pedagogue Nikolay Ladovsky advocated for a “rational” knowledge of architecture based on, what he posed as universal principles of spatial form. Their colleagues, Kandinsky, Rodchenko, Lissitzky and Ginzburg, were particularly instrumental in shaping the Rationalist doctrine through theorization, teaching, design and critique. All them taught at Vkhutemas at different moments. This ongoing research project initially conceived of as part of the diploma studios taught at the Moscow Architecture Institute. In Moscow and the surrounding region there are currently over a hundred workers’ clubs and palaces of culture, built between 1920s and 1930s. Today these buildings range from total decrepitude to active use. Some have gained a landmark status while others are being adapted for different uses. Their adjacent territories, which typically housed essential club functions, such as sports fields and playgrounds, are often subject to new development. The studios investigated the programmatic, organizational, and architectural qualities of the typology as a whole and studied the specific histories and formal attributes of a selection of these buildings. Students performed on-site research, documented the existing buildings and produced three-dimensional architectural analysis. 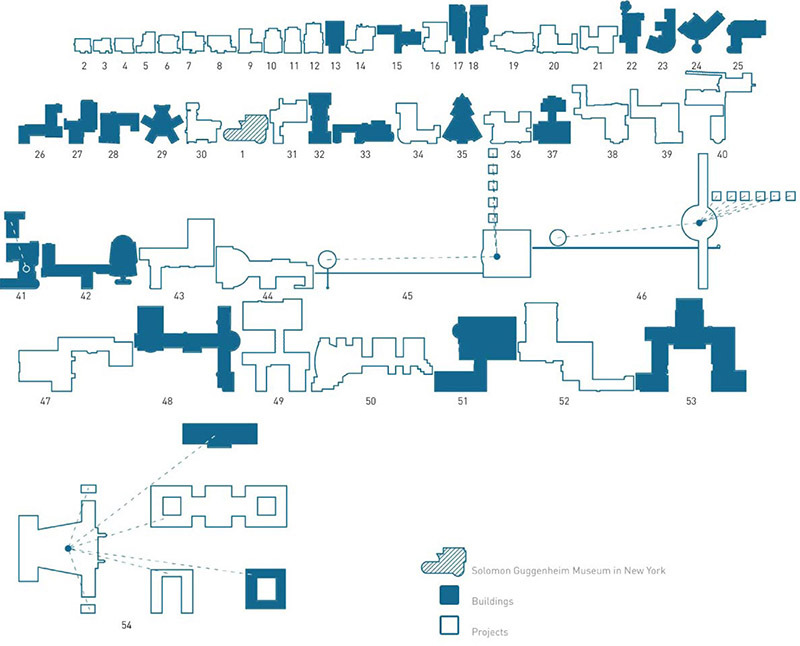 Research included mapping of the clubs around Moscow, performing comparisons of the buildings and their surrounding territories, and analyzing their link to the urban fabric. Archival investigations were conducted using historical maps and photographs, as well as period publications and magazines. The studio takes a close look at the relationship between the design school as an evolving program and the environment that houses it. In this light, a design school is not just a neutral background or a static container but rather an active agent, engaged in the life of a school on a number of levels. It shapes the ways in which students interact with faculty and with each other. It plays a fundamental, if silent role in promoting collective activities and supporting individual pursuits. It functions as a bridge between the germ of experiment, present at the heart of all innovative schools, and the perpetuation of tradition, a vital sign of any reputable institution. Ultimately, it is the grafting of those pedagogical practices onto their environment that not only makes a place, but also gives rise to and shapes the ever-present, yet intangible culture of a school, and its unique disciplinary form - studio culture. This research project, developed as part of the diploma studio that investigates the origins and fundamental components of the contemporary urban fabric, using Moscow as a case study. It is framed in terms of four basic architectural typologies: transportation terminal, office complex, housing development, and recreation center. 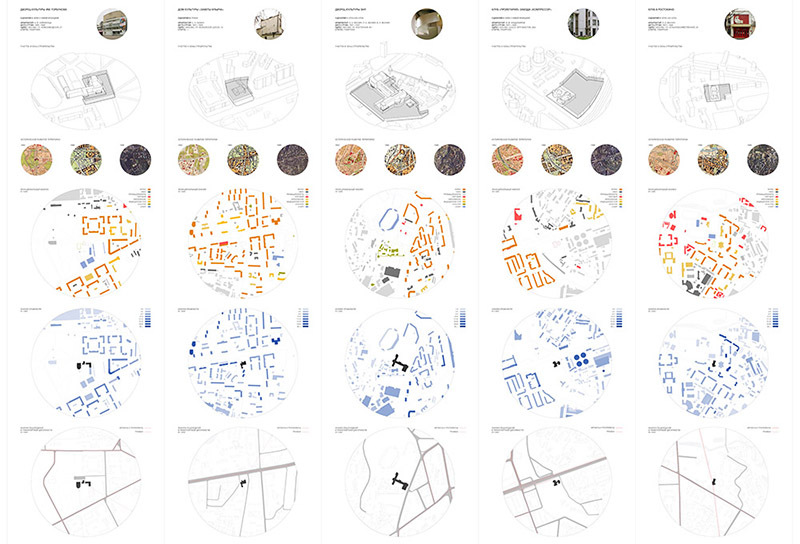 These typologies in turn form a basis for an urban approach that was not about a static urban ensemble but rather about a series of local measures for improving the dynamically changing urban fabric. The goal was not to mimic the avant-garde aesthetic but rather to reveal and interpret the values that were introduced at the time, such as, integrating public space. Public space became a unifying factor for all four typologies and plays a defining role in each of the design typologies. In addition to the historical analysis of the avant-garde, a significant importance was placed on studying the site and existing context as well as on formulating the programmatic requirements and spatial connections. Made from easily available materials, such as plaster, wax, or plastics, these studies are a result of an experimental studio practice that fuses the programmed, the accidental, and the intentional. The process is structured as a synthesis of simple geometries in dialogue with physical laws, such as gravity or tension, through the use of basic operational algorithms. Diversity of organic forms, structures, and textures, a result of countless natural processes - chemical, geological, biological – served as a reference for the project, defining a selection of typologies and templates. 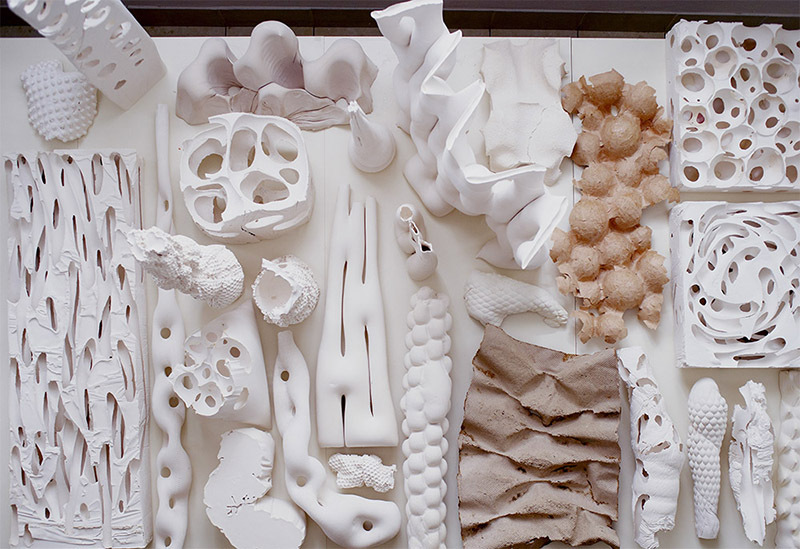 The resulting forms invite associations with structures and formations created by natural processes such as growth, decomposition, or erosion; others recall activity of biological species such as anthills, beehives, or corals. The focus of the studies is on the process of making as much as on form, linking the work with nature in fundamental ways, that are both proto - and post-sustainable.